The Shtora-1 EOCMDAS (electro-optical counter-measures defensive aids suite) is one of the several unique features of Russian MBTs that distinguish them from the rest of the world. It was developed by VNII Transmash in St.Petersburg in cooperation with Elers-Elektron in Moscow, and introduced somewhere around 1988. 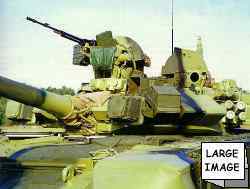 This system effectively protects an MBT against the two most common ATGW types: wire-guided SACLOS systems (e.g. TOW, HOT) and laser-guided ATGMs (e.g. Hellfire, Copperhead). Shtora-1 consists of a specialized computer/control panel, two electro-optical interference emitters located on each side of the gun, four laser sensors located on top of the turret, and racks of dedicated anti-laser smoke grenades. The Shtora has two combat roles. In the first role, it works against IR guided ATGMs, by aligning the turret front to the incoming ATGM and using IR emitters to send false signals which scramble the ATGM guidance system. The principle involved is the following. Wire-guided missiles such as the American TOW are guided to the target by means of a wire and a flare on the back of the missile. The flare is used to keep a 'reference point' of the missile in relationship to the target lock held by the operator, and the guidance computer tries to put the flare on the reference point. Shtora emitters create a large hotspot, essentially tricking the missile guidance into following the Shtora hotspot instead of the flare hotspot, resulting in faulty course corrections by the ATGW computer. In fact, the computer shall usually believe that no horisontal course correction is necessary since the false flare comes from the same direction as the targeted tank, while vertical corrections shall cause ATGM to either dive into the ground or climb into the sky, depending on whether the operator holds the lock below or above the emitters. The second part of the system defeats laser guided weapons. When a laser beam is detected the Shtora informs the crew with light and sound; it then launches laser defeating smoke grenades, which enshroud the tank and break or degrade the lock. The tank commander can also press a button that will turn the turret front to the laser to meet incoming ATGM with the best protected section and to engage the laser beam source with the maingun. This page is © 1998, 1999, Sauron's Creations.